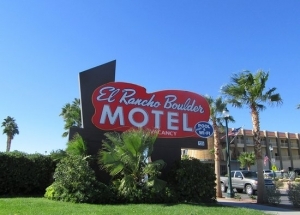 The El Rancho Boulder Motel is the perfect place to stay is you are visiting Hoover Dam or going to Lake Mead. The swimming pool is solar heated and guests can enjoy a cook out on the propertyÂ’s BBQs. Each room is fully equipped with refrigerators and microwaves or you can request a room with a full kitchen. Amenities include free parking, high speed internet and are also pet friendly. Military, Government and seniors should inquire about discounts that are available.